Sunday, September 10th, at 7PM, I'll be appearing on the Cold River Radio Show, an old-fashioned variety program that records live before a studio audience in Intervale, New Hampshire's Theater in the Wood. It promises to be a tremendous evening, full of story and song. Click through for more information. On September 24th, my little sister's getting married. You probably can't come, but I'm very happy for her, so it seemed worth mentioning. From October 12th to 15th, I'll be in Toronto for Bouchercon, where RED RIGHT HAND is up for the 2017 Anthony Award for Best Novel. I'll also be on a couple panels, about which I'll post in greater detail as the time nears, since this update is threatening to be way too long already. And from November 10th to 12th, you'll find me at New England Crime Bake, where I'll also be on a panel. Again, details to follow as we get closer to the event. 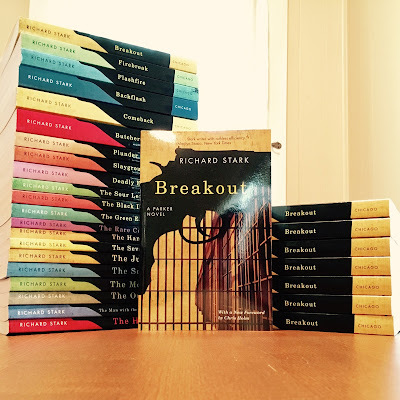 The University of Chicago Press' reprint of Richard Stark's BREAKOUT, to which I contributed a foreword, comes out September 5th. The last three books in the series come out the 5th as well, at which point the entire series will be in print for the first time. Fellow Parker fans, rejoice! RED RIGHT HAND comes out in paperback on October 10th. It's got a snazzy new cover I'll be releasing soon, so stay tuned. I've got a creepy short story called "The Group Home" in Hex Publisher's BLOOD BUSINESS anthology, which comes out November 7th. BLOOD BUSINESS is a collection of dark, gritty crime stories, half of which feature paranormal elements. I'll leave you to discover which half my story belongs to. Dustin Tucker, who starred in Portland Stage's irreverent production of Sherlock Holmes' "The Hound of the Baskervilles," is adapting my short story "The Well" for the stage as part his The Haunting Hour series. The event runs from October 25th to November 4th, and also features work from Tess Gerritsen, John Cariani, and many more. If you manage to snag tickets to the showing on the 28th, you might just see me there! Donald Westlake is one of my literary idols. His Parker books—written under the pen name Richard Stark—comprise, in my opinion, the finest crime series ever written. The series (twenty-four books strong) kicked off in 1962 with THE HUNTER and concluded with DIRTY MONEY, which was published shortly before Westlake's death in 2008. Thanks in part to a twenty-three year hiatus between 1974's BUTCHER'S MOON and 1997's COMEBACK, the series has never been in print in its entirety... but that's about to change. The University of Chicago Press began reissuing the series in 2008, with forewords from such crime fiction luminaries as Charles Ardai, Lawrence Block, and Dennis Lehane. Next Tuesday, September 5th, they're releasing the last four books in the series. NOBODY RUNS FOREVER and ASK THE PARROT feature forewords by Duane Swierczynski. Laura Lippman penned the foreword for DIRTY MONEY. BREAKOUT includes a foreword by, um, me. I can't tell you what an honor it is to be a footnote in this series. I hope I did it (and the late, great Donald Westlake) justice, because its influence on my work can't be overstated. Many thanks to Maggie Hivnor-Labarbera and everybody at The University of Chicago Press, both for the opportunity and for ensuring that a whole new crop of readers will have the opportunity to fall in love with the Parker books like I did.